We totally stole that title from Michael Bradley Block, but WE DON'T CARE! But the biblical comparisons don't stop there, because we sat down this week and talked to the way, the truth, and the light: Anna Dart and Asia Kate Dillon. These angelic women (they play part of the Angel Chorus and Lucifer, respectively, so we're allowed to call them that) are two of the members of The Mysteries, a 53-actor production at The Flea. This five-hour interpretation of The Bible, composed by 48 different writers, is a massive evening full of food, fun, and Jesus. But it only runs until May 25th, so even if you have to trek through the desert, find a way to see this show! From the casting out of Lucifer to Judgement Day, each episode (of which there are about fifty) approaches the story with a different writer's perspective, but plenty of heart, humor, and theatrical magic. Top this off with dinner, desert, music, and lots of interaction with the actors themselves, and you have five hours that will fly by. But don't take our word for it! This show is a New York Times critic pick! So read the review HERE, then come back and listen to the podcast. Or read while you listen, if you're that kind of talented person. So, as usual, the podcast is below, give it a listen, then check out the awesome links below that! David was true to his word as always and linked everything he said he would, namely Asia's awesome "What You Will" tattoo. 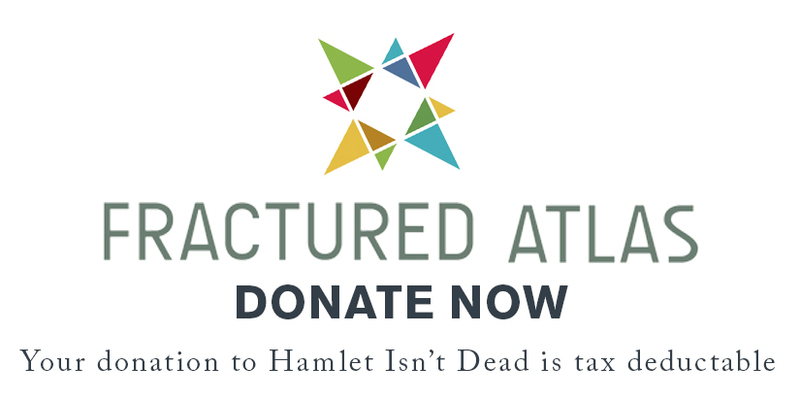 In the beginning there was the word, and the end has yet to come, but somewhere in the middle there's still Hamlet Isn't Dead: Theatre You'll Love, Whether You Like It Or Not. For more information on The Mysteries, click HERE! For tickets to The Mysteries, click HERE! And to see Asia's awesome tattoo, click HERE! And if you or anyone you know feels the need to join us on an episode of Tales Told by a HIDiot (the world's 63rd greatest Shakespeare-related podcast), e-mail us at hamletisntdead@gmail.com and we'll save you a seat!